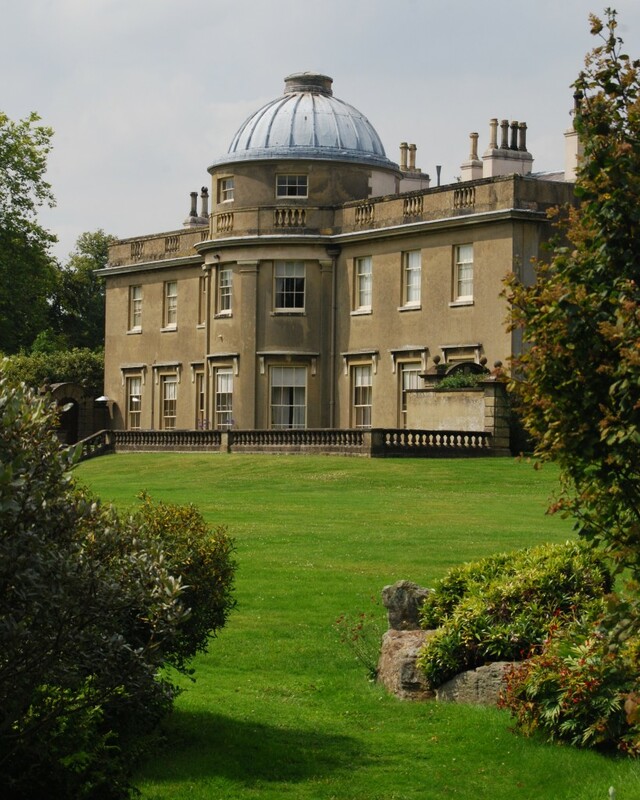 Sion Hill Hall has been described – convincingly but imprecisely – as “the last of the great country houses”. It was built for Percy Stancliffe, the son of a wealthy brewer by one of Yorkshire’s foremost local architects, Walter H Brierley, in 1912-3. Walter Brierley (1862-1926) was a partner in the dominant York architectural practice which was begun in the eighteenth century by John Carr and had included in the intervening years such figures as J P Pritchett (1789-1868) and G T Andrews (1804-55, architect to the North Eastern Railway). Like John Carr, Walter Brierley’s fame was limited because his work is concentrated in the North. He built a rich collection of houses, churches and public buildings including a distinctive series of 1890s school buildings for the York School Board and the Principal’s House at the King’s Manor in York. He restored Sledmere House after the major fire in 1911 and designed Welbeck Woodhouse, Nottinghamshire, which was built (1930-1) after his death. At Sion Hill Hall there were temperamental clashes between the rich but parsimonious Percy Stancliffe and his perfectionist architect, whose belief that “cheap work is always there to remind and annoy us” did not encourage a quiet relationship. Nevertheless, the resulting building made Brierley’s reputation as “the Lutyens of the North”, and its expansive horizontal façades, enlivened by generous hipped roofs and tall chimneys, have a strong air of assurance, with an ambitious classical doorcase, dated 1913, as an entrance and on the south-facing garden front, roundels and painted shutters. In fact, the house is only one room deep, with connecting corridors the length of the north front and all the principal rooms facing the sunny south. At the western end the corners are stepped, so that Percy Stancliffe’s study and his wife’s boudoir share the advantage of south- and west-facing windows. Percy Stancliffe lived at Sion Hill House until his death in 1949. It was eventually purchased in 1962 by a remarkable collector, Herbert W Mawer (1903-1982), who rose from humble origins, trained as a chef at the Royal Station Hotel in Hull and started his own model bakery, “Our Herbert’s”, at Stokesley in 1926. The family business prospered enough for Herbert to retire in his forties with sufficient wealth to support a passion for antiques which had begun with the purchase of two candlesticks for £1 5s in Hull when he was eighteen. In the late 1930s he bought Ayton Hall near Guisborough, but by the 1950s that modest Georgian house was too small to house his accumulating possessions. Herbert Mawer chose, in the absence of an heir, to establish the H W Mawer Trust to administer Sion Hill Hall and the Mawer Collection, which has since his death been increased to include the remarkable pot that contained the Breckenbrough Hoard (discovered in 1985) and paintings by the identical twins Dorothy and Elizabeth Alderson (respectively 1900-1992 and 1900-1987), who were Herbert Mawer’s aunts. The house is open for group visits by prior arrangement: http://www.sionhillhall.co.uk. This entry was posted in Country Houses, Country Houses of North Yorkshire on January 28, 2014 by Mike Higginbottom. I never tire of visiting Burton Agnes Hall in North Yorkshire. It has so much to offer the visitor. 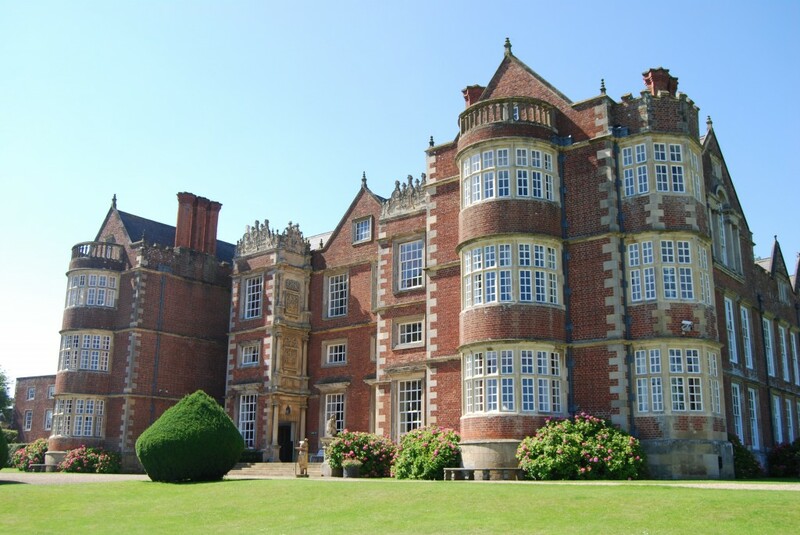 It’s one of the most beautiful of Jacobean country houses, in warm brick with distinctive round “compass bays”, with extraordinarily fine wood panelling, fireplaces and a magnificent staircase. The history of the place goes back a long way. In the grounds, behind a seventeenth-century façade, are the standing remains of the original Norman manor house. 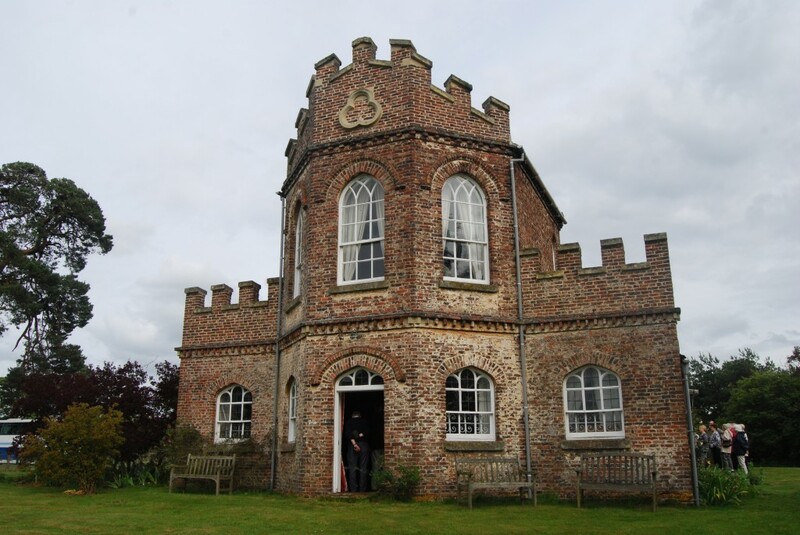 The Jacobean house was built by Sir Henry Boynton after he was appointed to the Council of the North in 1599. His daughter Anne was attacked nearby and subsequently died of her injuries. She asked her sisters to make sure that after her death her skull should kept within the house saying that “if my desire be not fulfilled, my spirit shall, if it be permitted, render the house uninhabitable for human beings”. Initially, her corpse was buried intact in the churchyard, but the supernatural ructions were such that, in consultation with the vicar, the sisters had the grave reopened and the skull brought within, upon which peace was restored. Subsequent attempts to remove the skull from the premises – in one instance by burying it in the garden – always led to terrifying consequences until eventually the skull was interred within the walls. Anne, and Burton Agnes, now rest in peace. Marcus Wickham-Boynton, who owed Burton Agnes Hall between 1947 and 1989, resolved when he inherited to live “quietly, but not too quietly”, and spent his life modernising and beautifying the house and its gardens. With the Yorkshire architect, Francis Johnson, he brought in panelling and fireplaces from neglected and unwanted houses and restored the long gallery, which had been divided into bedrooms and a store. Marcus Wickham-Boynton was an astute art collector, bringing to Burton Agnes an impressive array of English and French paintings by such artists as Paul Cézanne, Paul Gaugin, Duncan Grant, Augustus John, Edward Lear, Édouard Manet, Henri Matisse, Camille and Lucien Pissarro, Pierre Auguste Renoir, Walter Sickert and Maurice Utrillo, alongside two impressive bronze busts by Sir Jacob Epstein. His heir has added further items that are displayed in the Long Gallery, such as a tapestry by Kaffe Fassett and furniture by John Makepeace including the Millennium collection, ‘Tuscan Obelisk’, ‘Spiral’ and ‘Coppice’. Visitor information for Burton Agnes Hall is at http://www.burtonagnes.com/Home.html. The 40-page, A4 handbook for the 2009 Country Houses of North-East Yorkshire tour, with text, photographs, a chronology and a reading list, is available for purchase, price £15.00 including postage and packing. To view sample pages click here. Please send a cheque, payable to Mike Higginbottom, to 63 Vivian Road, Sheffield, S5 6WJ. This entry was posted in Country Houses, Country Houses of North Yorkshire, Country Houses of North-east Yorkshire, Life-enhancing experiences on January 19, 2014 by Mike Higginbottom. You can spend an enjoyable day in North Yorkshire pretending to be an eighteenth-century aristocrat lording it over the landscape. 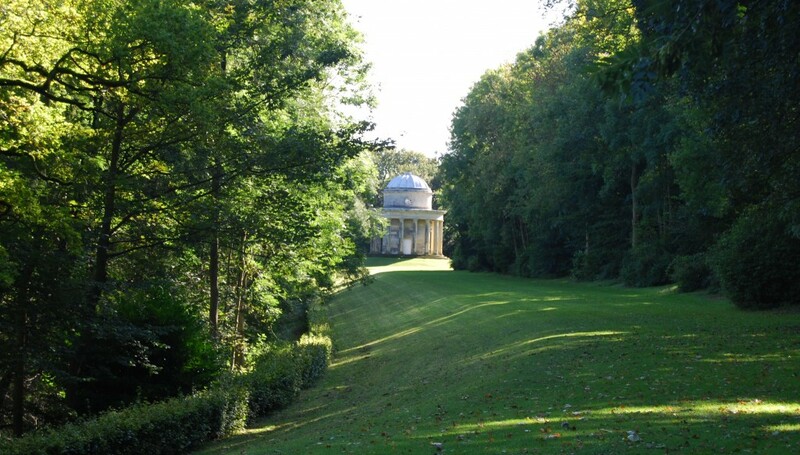 Visit (in either order) Duncombe Park [http://www.duncombepark.com/the_garden.shtml] and Rievaulx Terrace [http://www.nationaltrust.org.uk/rievaulx-terrace]. In the grounds of Duncombe Park, stretching along Ryedale towards Rievaulx Abbey, are a series of artificial high-level terraces. Duncombe Terrace is significant because it’s one of the first such features to ignore formal geometry and follow the contour. It’s punctuated by two temples dating from around 1730, an Ionic rotunda which closely resembles Vanburgh’s Rotondo at Stowe (1721), and a circular Tuscan temple. The terraces at Rievaulx are rather later, dating from about 1758. The pattern is the same, with a temple at either end, and the Rievaulx temples follow the same classical orders as their companions at Duncombe, but in this case a circular Doric Temple is paired with a rectangular Ionic Temple. Both are spectacularly expensive ways of giving guests somewhere to stroll, and apart from the landmark temples, each provides dramatic vistas: the Duncombe terrace looks across to Helmsley Castle, while the walk at Rievaulx provides a whole series of views, cut through the trees, to the ruins of Rievaulx Abbey in the valley below. The two sets of terraces are some three miles apart, and it’s probable that they were meant to connect by means of a scenic ride. Large worked stones found in the intervening river-bed could have been the basis for a viaduct. The whole composition…is a superlative example of large-scale landscape gardening and of that unquestioning sense of being on top of the world which the rich and the noble in England possessed throughout the Georgian period. This entry was posted in Country Houses, Country Houses of North Yorkshire, Country Houses of North-east Yorkshire, Life-enhancing experiences on January 10, 2014 by Mike Higginbottom. After decades of talk of “the destruction of the English country house” it’s refreshing to find more and more houses that were given over to institutional use have been restored as homes in the past twenty years. One such is Duncombe Park House, North Yorkshire, (1713) designed by the gentleman-architect William Wakefield, possibly with assistance from Sir John Vanburgh, who was at the time coming to the end of his work at Castle Howard. It’s a house that has survived a succession of crises. All but the shell of Duncombe Park was destroyed by fire on a snowy night, January 11th 1879. The parish magazine describes how the maids woke to the sounds of crackling and extremely hot carpets. The water-supply to the house had been turned off to prevent frozen pipes, so the main block burnt to a shell although all of the family, guests and servants and – after desperate efforts – many of the contents were saved. Work on rebuilding the main house stopped when the heir, Viscount Helmsley, died unexpectedly in 1881, leaving a two-year-old son to inherit from his grandfather, the 1st Earl of Feversham. When rebuilding resumed in 1891, the architect William Young based his plans on the original design and some surviving fabric, but with an additional bay projecting the east front further into the garden. He also made the original round-headed windows square, and reduced the interior size of the entrance hall, converting the design of its plaster ceiling from an oblong to a forty-foot square. In 1894 a further fire destroyed furniture, tapestries and £6,000-worth of jewellery that had escaped the 1879 fire. The damage was quickly restored, with the addition of a chapel by Temple Moore, in 1895. When the second earl, grandson of the first, was killed in 1916 at the Battle of the Somme, a year after inheriting the title, his son took the title at the age of ten, inheriting an estate encumbered with two sets of death duties in rapid succession. Duncombe Park House was let to the Woodard Foundation and opened as Queen Mary’s Girls’ School in 1926. The third earl throughout his life lived at Nawton Tower elsewhere on the estate. At his death in 1963 the earldom died out but the older barony passed to his fourth cousin, the 6th Lord Feversham, at the age of eighteen. It now belongs to his son, the 7th Lord. The school’s lease did not cover repairs, and Lord Feversham was not prepared to allow modern buildings to be added, so when a break-lease fell due in 1986 Lord and Lady Feversham chose to reclaim the house, and the school removed to Baldersby Park near Thirsk – another fine early-eighteenth century house, though much altered, by Colen Campbell. 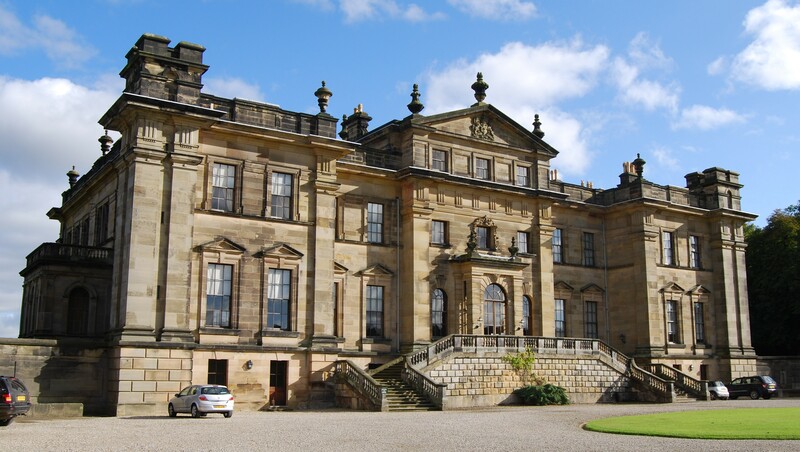 The restoration of Duncombe Park was carried out by Martin Stancliffe to such a standard that it’s difficult to visualise that the place was for sixty years a thriving, though apparently well-disciplined boarding school. It’s a shame that it’s no longer possible for the general public to tour the house at Duncombe Park, though the gardens remain open: http://www.duncombepark.com/index.php. This entry was posted in Country Houses, Country Houses of North Yorkshire, Country Houses of North-east Yorkshire, Victorian Architecture on January 10, 2014 by Mike Higginbottom. Nobody had informed me that at one view I should see a palace, a town, a fortified city, temples on high places, woods worthy of being each a metropolis of the Druids, the noblest lawn in the world fenced by half the horizon, and a mausoleum that would tempt one to be buried alive; in short, I have seen gigantic places before, but never a sublime one. HENDERSKELFE STOOD, AND CALL’D IT CASTLE-HOWARD. PLANTATIONS BELONGING TO THE SAID SEAT. Of all these out-works and monuments, the most sublime is undoubtedly the Mausoleum, designed by Nicholas Hawksmoor in 1728-9, begun in 1731, and completed substantially to the original design in 1742, six years after Hawksmoor’s death and four years after Carlisle’s. 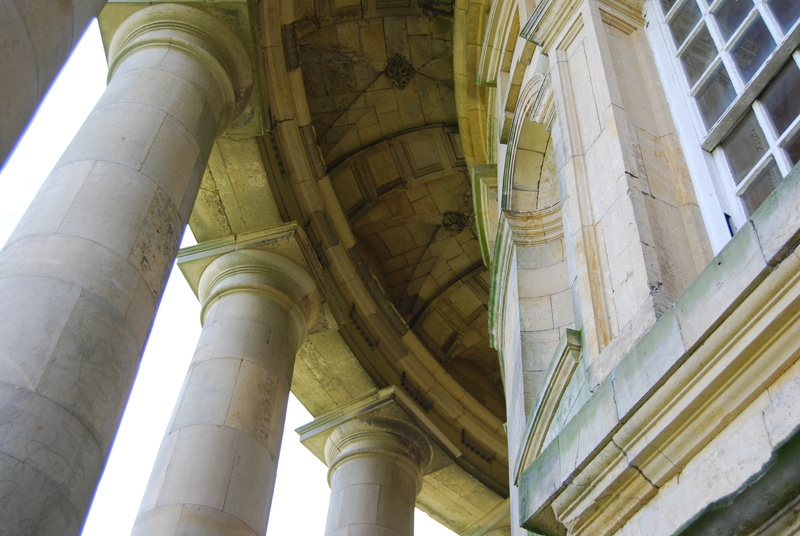 This great domed rotunda, seventy-six feet high, its twenty slender Doric columns set deliberately narrowly together, sitting on a bastion of gargantuan proportions, is a noble monument not only to Lord Carlisle, whose remains were finally laid to rest there, but also to its designer, who never saw it. Members of the Howard family continue to be interred in the Mausoleum, which is off limits to ordinary visitors. 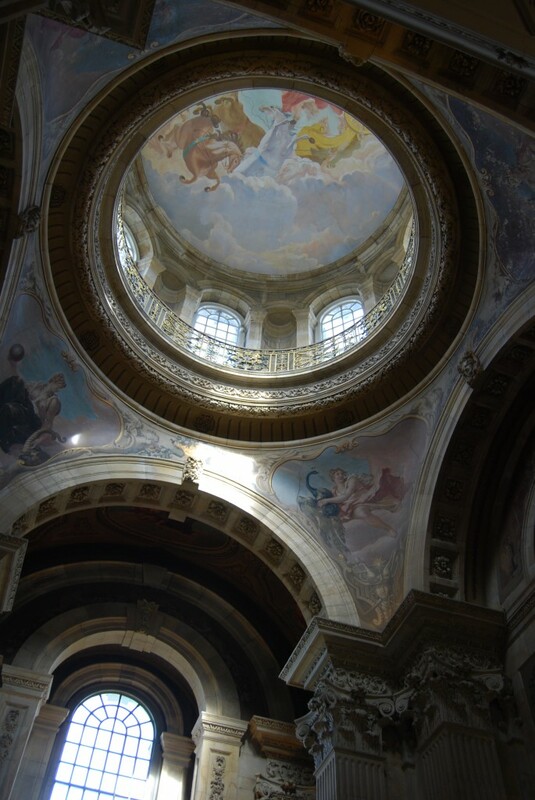 But it is possible to see inside the Mausoleum, and to visit other inaccessible parts of the estate, on pre-booked walking tours which are detailed in the Castle Howard website at http://www.castlehoward.co.uk/Whats-On.html. The walking isn’t strenuous, though the tour can take up to 2½ hours. It’s worth every step. This entry was posted in Country Houses, Country Houses of North Yorkshire, Country Houses of North-east Yorkshire, Life-enhancing experiences on January 6, 2014 by Mike Higginbottom. Castle Howard is not Brideshead, though it owes a great deal to Brideshead Revisited. It’s acknowledged that Evelyn Waugh’s wartime novel was based on the Lygon family who lived at the very different Madresfield Court, Worcestershire, which has its own stock of stories: http://www.telegraph.co.uk/news/uknews/theroyalfamily/8270238/Madresfield-Court-The-Kings-redoubt-if-Hitler-called.html. The only connection between Brideshead and Castle Howard is through television, and it’s proved crucial to the fortunes of the house and its family, the Howards. The house was built by their ancestor, Charles Howard, 3rd Earl of Carlisle (c1669-1738), who hired the multitalented playwright, John Vanburgh (1664-1726), to design a baroque palace on the site of the ancient castle of Henderskelfe. The Great Hall is a stupendous space, seventy feet high and fifty-two feet square, surmounted by the great dome. The paintings of the hall, dome and high saloon were by the Venetian Giovanni Antonio Pellegrini and the Huguenot Jean Herve. In the period before the Second World War, canny country-house owners offered their properties to well-behaved girls’ schools: the Duke of Devonshire, for example, saw to it by this means that Chatsworth was well looked after, but at Castle Howard an accidental fire on November 9th 1940 gutted much of the interior and destroyed Vanburgh’s dome. The owner George Howard (1920-1984) spent much of his adult life breathing life back into Castle Howard. The dome was restored in 1960 and the lost Pelligrini murals reproduced a couple of years later by the Canadian painter, Scott Medd (1911-1984). George Howard, who was at the time Chairman of the Board of Governors of the BBC, was very glad to hire the place to Granada TV for their series-adaptation of Brideshead Revisited (1981). The proceeds enabled him to rebuild some of the rooms on the south front, to the designs of Julian Bicknell with paintings by Felix Kelly. His son, the Hon Simon Howard, the present owner, similarly welcomed Julian Jarrold’s feature-film production in 2007 (released 2008). This enabled further rooms to be brought back to use, and the story is told in an exhibition ‘Brideshead Restored: The Story of Restoration at Castle Howard and Brideshead Revisited’. For thousands of visitors and millions of viewers, Castle Howard is Brideshead. It isn’t really, but it might as well be. Castle Howard deserves a day to itself, at almost any time of the year: http://www.castlehoward.co.uk. If the house is open don’t miss eating in the Fitzroy Room restaurant. When you look out of the upstairs windows of the south front of Scampston Hall your eye is caught by a red-brick castellated lodge in the distance. This is Deer Park Lodge, built by John Carr of York in Gothick style c1768 as an eye-catcher across the lake. Originally, it was stuccoed in white, so that it stood out from the now-vanished forest behind it. As well as being an ornament to the view, the lodge served a practical function. To each side of the central bay were arcades to provide shelter when the deer came to feed. Behind the building was a modest cottage in which the deer-keeper and his family lived. The three-sided bay, with its castellated gable embellished with a trefoil, contains two grand rooms, connected by a steep, straight staircase. Both have marble fireplaces and were decorated, apparently, with marbled paper. The upper room, where visitors from the great house would take tea and admire the view, has a delicate plaster ceiling decorated with hunting horns and sheet music. The current owners, David and Jane Crease, have carefully restored the lodge, and Jane explains how the three sides of the bay offered completely different views – the forest to the right (nature), the house straight ahead (culture) and the mill to the left (commerce). Mr & Mrs Crease entertained the members of the Art Fund South Yorkshire to tea on their way back from an art day in Scarborough. It’s a rare privilege to enjoy a sumptuous afternoon tea sitting outside the lodge gazing across the lake towards Scampston Hall in the distance. One of the ironies of an eye-catcher is that it commands at least as good a view as the view it belongs to. No doubt that’s why the St Quentins and their descendants, the Legards, drove over to admire the big house in its setting. Scampston Deer Park Lodge is a private residence and is not open to the public. This entry was posted in Country Houses, Country Houses of North Yorkshire, Survivals & Revivals: past views of English architecture on January 1, 2014 by Mike Higginbottom. Motorists hammering along the A64 to the coast have little chance of noticing that they fly through the Capability Brown park of Scampston Hall. An understated road-sign indicates ‘Scampston only’. It’s worth following. Apart from its historic interest, Scampston Hall has a superb restaurant, offering better lunches than you’ll find within sight of the A64. Its historic interest is considerable. Five St Quintin baronets, all of them called William, developed this estate. The 3rd baronet built the original house, parts of which are still visible at the back, in the 1690s. The 4th baronet brought in Lancelot ‘Capability’ Brown to landscape the park. The 5th baronet accumulated a significant art collection. His heir, William Thomas Darby St Quintin, employed the architect and interior designer Thomas Leverton to transform the house in 1800-3, so that it looks – inside and out – Regency in style. The man who takes your ticket when you start a house tour is, in fact, the current owner, Sir Charles Legard, 15th Bt. He and his wife Caroline took on the place in 1994 when it was, as Sir Charles puts it, “tired”, reroofed, rewired and replumbed it, and welcome the public on a limited number of days each year. Their son Christopher’s family now lives there. Lady Legard had, through her voluntary involvement in the National Trust, gained an invaluable apprenticeship from the interior designers John Fowler and David Mlinaric, planning the restoration of Beningborough Hall, Nostell Priory (after a fire) and Nunnington Hall. She was more than qualified to take on the challenge of managing the restoration of her family home to the highest standards. Scampston Hall was the Country Life House of the Year in 2000: John Cornforth’s account of the house and family appeared in the January 27th and February 3rd 2000 issues. Lady Legard then set about finding a purpose for the former kitchen garden. She commissioned the internationally renowned Dutch designer Piet Oudolf [see http://www.oudolf.com/piet-oudolf/references] to create a flower garden to attract public visitors, and engaged the local architects Mark Bramhall and Ric Blenkharn to design the restaurant. The Walled Garden opened in 2004. The result is an utterly delightful visiting experience. Sir Charles shows groups round his house in relaxed style: visitors are encouraged to ask questions and to sit on the furniture. Outside, a half-hour walk around the inner park, the Cascade Circuit, passes the Pump House with its plunge bath, the Palladian Bridge and the ruined ice-house. The Walled Garden is a fascinating essay in contemporary garden design. And the restaurant offers the sort of menu you need to return to. Details of all that Scampston Hall has to offer are at http://www.scampston.co.uk/metadot/index.pl?id=0. 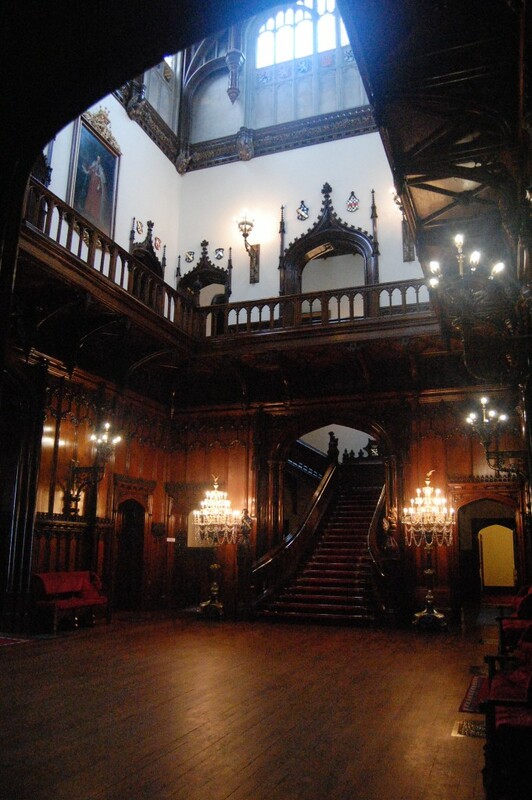 Card-carrying members and Friends of the Historic Houses Association are admitted free. This entry was posted in Country Houses, Country Houses of North Yorkshire, Life-enhancing experiences on January 1, 2014 by Mike Higginbottom.